VPK stands for the Voluntary Prekindergarten Education Program. There are no income requirements to be eligible for VPK. If you live in Florida, and your child turns 4 four years of age ON or BEFORE September 1st, your child is eligible to participate in our FREE Voluntary Prekindergarten (VPK) education program. Voluntary Pre-Kindergarten or VPK gives children a jump start for school by developing the skills children need to become strong readers and students at an early age, making children more likely to be successful in school. Our VPK curriculum supports the idea that children learn best through fun and play. This means that every day includes fun, hands-on activities, revolving around the month’s theme. The activities and games they play are fun and also enhance their pre-reading, pre-math, language and social skills, all while teaching them about the world around them. Parents will quickly find that this teaching method proves itself very effective, once you see all the awesome stuff your child comes home with and hear all the knowledge they have to share with you! 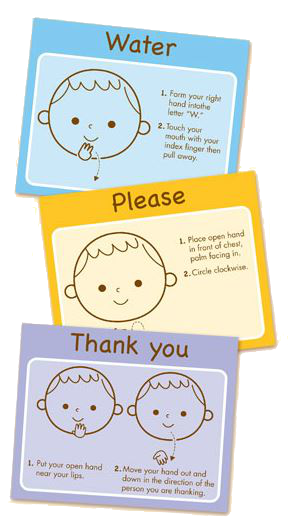 Our VPK curriculum also incorporates Spanish and Sign Language into the children’s daily lessons. At the end of each day, parents will receive a daily report, summarizing your child’s day. Daily reports will include a summary of the day’s lessons and fun activities, along with how well your child is working with others, and whether he/she might need some review of the lesson. School Year- The school year class is 3 hours per day, Monday thru Friday, and lasts the entire school year. Upon registration, parents may specify which class they’d like their child to participate in. Our morning class is from 8am – 11am and our afternoon class is from 11:30am – 2:30pm. Depending on the times your child is enrolled, children will receive breakfast, lunch and an afternoon snack for free! Extended care is also available. Summer- Summer classes consist of 6 hours per day, Monday thru Friday. Class begins at 8:30am and lasts until 2:30pm. Breakfast, lunch, and an afternoon snack are provided for free! Extended care is also available. 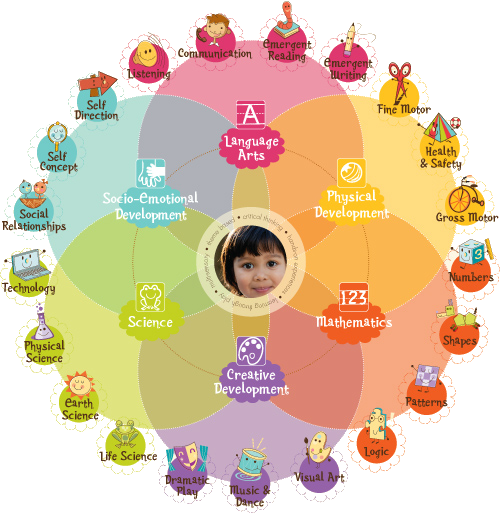 The learning web to the right shows the six main areas of development covered throughout our VPK curriculum, which are broken down into more specific domains. Our VPK teacher will focus on each domain during the program, incorporating fun and exciting games, activities and demonstrations. For example, when the kids are learning about animals on the farm, the teacher may ask the children to milk a cow’s udders. Except these udders are actually a glove filled with milk! This particular activity covers a few different domains, including life science, fine motor, listening, communication, dramatic play and numbers. Enrolling is as easy as 1-2-3! 2) Get your VPK certificate by applying online or on-site. 3) Turn your VPK certificate in to Alphabet Land Learning Center. Turning in your VPK certificate will guarantee your child a spot in our VPK program. Before the program begins, we’ll ask parents to attend our VPK orientation, where parents get the chance to meet the teacher, learn about what she has planned for the year, and ask any questions you’d like answered. At this time, parents will also be reminded to complete an enrollment application and to get copies of your child’s physical and immunization records.